Back in 1991, Mechanix knew right away they had a good thing going with Mechanix Wear Gloves. They had no idea what kind of revolution they would start. From the first use of Mechanix Wear "Original" Gloves by pit crew teams at the Daytona 500, Mechanix Wear gloves have been the leader in the high performance work glove market. Before they knew it, they had 41 NASCAR teams asking for Mechanix gloves along with just about every other high profile motorsports team in every type of racing! As a result of the exposure, everyday mechanics, technicians, construction workers, Do-It-Yourselfers, industrial safety, emergency services, and military professionals all benefit from Mechanix products. Every Mechanix Wear product represents a total commitment to its intended use. They consider everything: fit, feel, function, durability, quality, style and value. There is a lot of dedication and pride in everything Mechanix does, and it all adds up to superior performing products for you, their valued customer. Whether you're jumping the pit wall at Daytona or just doing a little tune up in the garage, you can have complete confidence that Mechanix Wear products offer you the best protection in the industry. Mechanix Wear gloves are for more than just racing, they are for toolboxes everywhere. Mechanix Wear gloves are the best designed and most trusted brand of protective hand wear by the worlds top racing teams. The experience and exposure gained in the racing world has lead Mechanix Wear to branch out its R&D and develop some of the best hard use tactical gloves in the world. This is the Mechanix Wear M-Pact3 Glove, and it is one of the hardest-hitting, heavy duty protective gloves on today's market. On this new model, Mechanix Wear has added a Kevlar molded knuckle for superior protection, even during the hardest impacts. They then took the protection a step further by adding impact-absorbing, molded thermal plastic rubber finger protection, and a multi-layer synthetic leather palm with EVA interior foam padding. 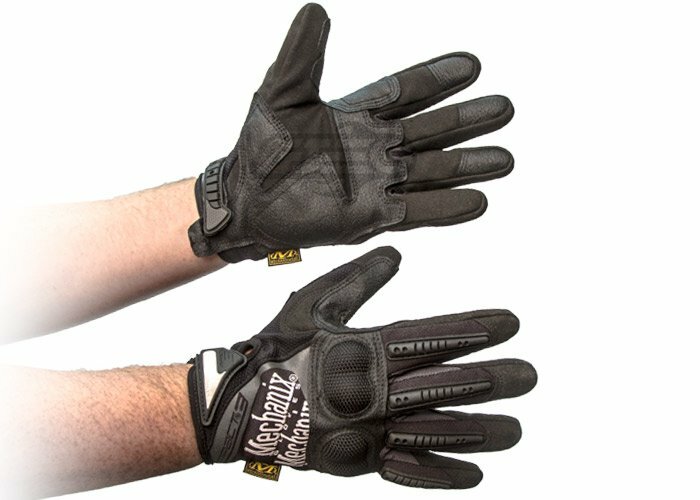 If you're looking for a glove that will not only allow you to maintain superior control over your airsoft gun, but will also protect your hands in even the most extreme circumstances, look no further than the Mechanix Wear M-Pact3 Glove.